NORWEGIAN DEFENSE LEAGUE WAS INFILTRATED BY RADICAL LEFTISTS FROM SOS RASISME…….. – The Tundra Tabloids……. 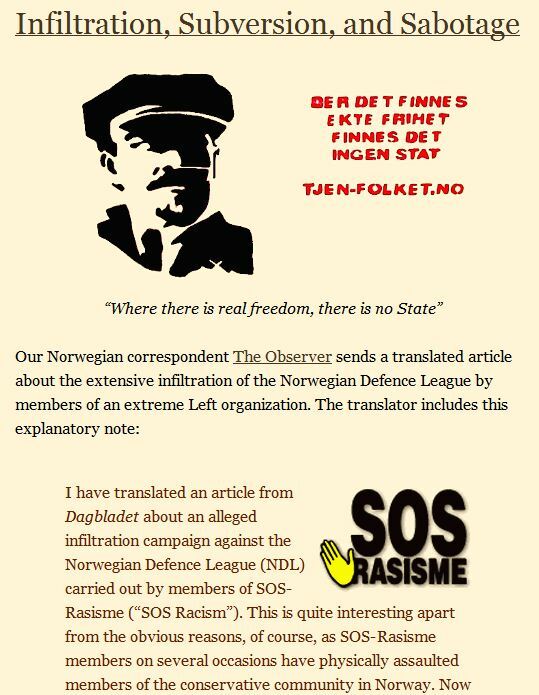 NORWEGIAN DEFENSE LEAGUE WAS INFILTRATED BY RADICAL LEFTISTS FROM SOS RASISME…….. The next time you read of ‘nasty elements’ within counterjihad groups, please keep this story in mind. I would like to thank the TT commenter and tipster, Jacob_M, for his repeated attempts to try to tip the TT in the comments, but for some unknown reason his efforts were thwarted by an unseen bug. He had a major story that he was finally able to send me, but it was much too late last night to tackle. At the same time, the Baron over at GOV informed me that he was working on the same story, so all’s well that ends well. Special thanks to all my faithful tipsters, your efforts have been, and always will be very appreciated. Several people with close ties to SOS-Rasisme built up the right-wing Norwegian Defence League, a former member of SOS-Rasisme claims. (Dagbladet): On April 9, 2011, on the anniversary of Nazi Germany’s invasion of Norway the anti Islamic and extreme-right wing organization, the Norwegian Defence league (NDL), staged a demonstration against the “Islamic occupation” in Oslo. At the time the organization had approximately a thousand members with strong anti-Islamic attitudes, including some well-known right-wing activists. Activists from the violent and extremist mother organization, the English Defence League (EDL) had come to Norway to participate in the demonstration. Dagbladet can now reveal that the demonstration was planned by anti-racists. According to several independent sources the management of NDL was at the time heavily infiltrated by individuals with close links to SOS Rasisme, and who held leading positions in the NDL. Previous Post Previous Post MANFRED GERSTENFELD INTERVIEWS YOHANAN MANOR: UN ‘ZIONISM IS RACISM’ REVISITED……..
Next Post Next Post HEAD PAL-TARD IN GAZA WHO ENGINEERED SCHALIT’S KIDNAPPING BECOMES CRATER FODDER BY IDF MISSILE……. These are the communists. They are the masters of underground sabotage and infiltration. I observed that the main drawback of the NDL and groups of the like, however, is that they cannot be so insidious and shrewd. This is a quite noble feature of personality indeed, but also rather contraproductive when dealing with snakes like those of the AFA. Patriotic movements should learn and use their weapons against them, and stop being so naive, otherwise AFA groups will always go some steps in advance, and the NDL and groups of the like will never have a real chance to stop them. How true. It definitely highlights the mindset of these people. Being devious has served the socialist marxists/fascists movements well. Not being able to get my message through was a tad frustration to sure, but at least it’s out now, which was a relief after all my frustration of not being able to post and not seeing anyone else having passed it on to you or the Baron. Speaking of being relieved: For the first time I’m truly relieved I’m not American. Reading the story on the Local about taxation of Americans living abroad on the Swedish version of thelocal, I figure that probably at least 5 900 000 our of 6 000 000 Americans living abroad are totally fucked now that the IRS is looking for ways to close the deficit gap. Including the overwhelming majority of all those Americans that’ve filed their taxes as an expat. Something about an FBAR thing requiring Americans living abroad to declaring all their assets abroad including such things as the highest balance at any time during the year on your (if any) pre-paid phone card, gift vouchers, etc. The lady in the article faced a seven figure penalty for simply not knowing about these rules, but apparently the IRL, being the good sports that they are, seem prepared to settle for 25% of this sum if she turned herself in and confessed to guilt. By treaty, EU banks seem obligated to install software on their computer system that reports on US citizens to the IRS starting in 2014, resulting in an increasing number of banks refusing to service to US citizens. The comments thread is very enlightening in providing additional information. This very second, thelocal site is down, but when it was upp, the story was near the bottom of the front page.